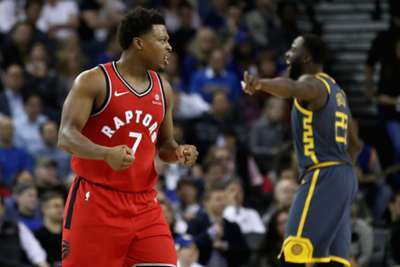 Adrian Griffin heaped praised on the "phenomenal" Kyle Lowry after he inspired the Toronto Raptors to another victory over the Golden State Warriors on Wednesday. Lowry led the way with 23 points and provided 12 assists as the Eastern Conference leaders completed a clean sweep of the NBA champions, winning 113-93 at Oracle Arena. With leading scorer Kawhi Leonard missing out again with a hip injury, Raptors assistant coach Griffin felt point guard Lowry proved he deserves another All-Star appearance next year. Griffin said: "When you play them you have to do a lot of things well. Lowry is eager to see Leonard back on court before long but said the Raptors have showed they have strength in depth. "Long-term we want healthy," Lowry said of Leonard. "We want him to take the time and get right. But knowing that him being out, a lot of things go through other people. "I've been here a long time and we've always said, 'Next man up'. That's how we've always treated everything." The Raptors are now 23-7 at the summit of the Eastern Conference.